One of the joys that I had writing for io9 was a column that I wrote about my stormtrooper build. Week to week, I provided some updates for readers on my progress, and got to do a deep dive into what building armor, cosplay and trooping entail. Movie CG gets better every year, and that’s bad news for the blockbusters of yesteryear which have a tendency to age really, really poorly. 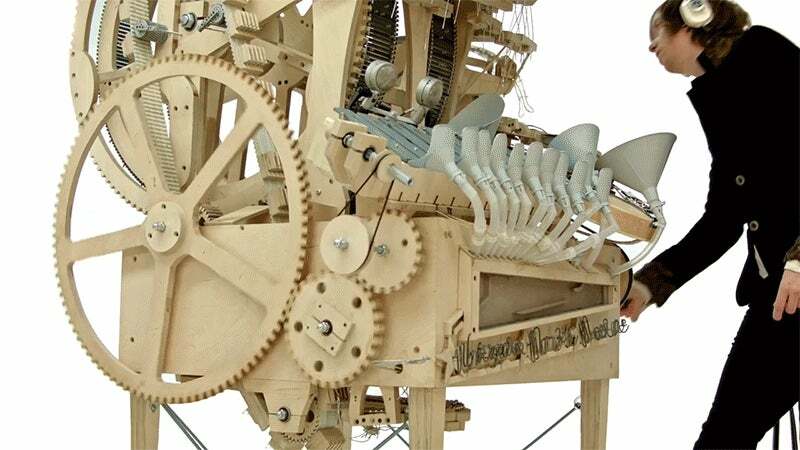 If you’re like us, you were probably impressed with Wintergatan’s fantastic Marble Music machine, which runs on 2000 ball bearings, and plays a really catchy tune. Now that the music video has gone viral, Martin Molin has released a pair of behind-the-scenes videos that show exactly how the machine works. The Empire is apparently alive and well. Today, a pair of Storm Troopers and R2D2 accompanied White House spokesman Josh Earnest on stage at the White House Press Briefing Room. A recently-released Star Citizen video demonstrates the game’s upcoming procedurally-generated planet system by zooming out from the pupil of a pilot all the way into space. Frank Ippolito and his team were asked by Sony to build a contest winner a full set of Titan armour from Destiny. After five weeks of work, they delivered, and then some. It sounds like a bizarre video game mashup, but farmers have reported “zombie” plants since the early 1600s: plants that took on a sickly yellow look and grew strange leaf-like structures or bushy growths instead of flowering and reproducing. On October 18, 1985 Nintendo of America took a huge gamble, releasing a console into a North American market that seemed to have washed its hands of video games completely. Thirty years later those hands are filthier than ever. The JKL Museum of Telephony, dedicated to preserving the history of phones, was destroyed last week as one of the worst wildfires of the summer raged across the central valley of California. Destroy all the bullets. But since we can’t do that because the sanctity of America rests on people’s ability to shoot things, destroy some bullets. Like these 2000 bullets that are probably passed their lifetime! Turns out, bullets make for some crazy works of fire. It’s basically explosive popcorn. Tony Stark’s Iron Man is easily one the most popular character in the Marvel movie-verse. Once the Secret Wars smoke clears, Brian Michael Bendis and David Marquez are tasked with making him just as popular on the comic page. It’s not going to be easy. Get ready for orbital insertion over target drop zone. War Stories is coming.